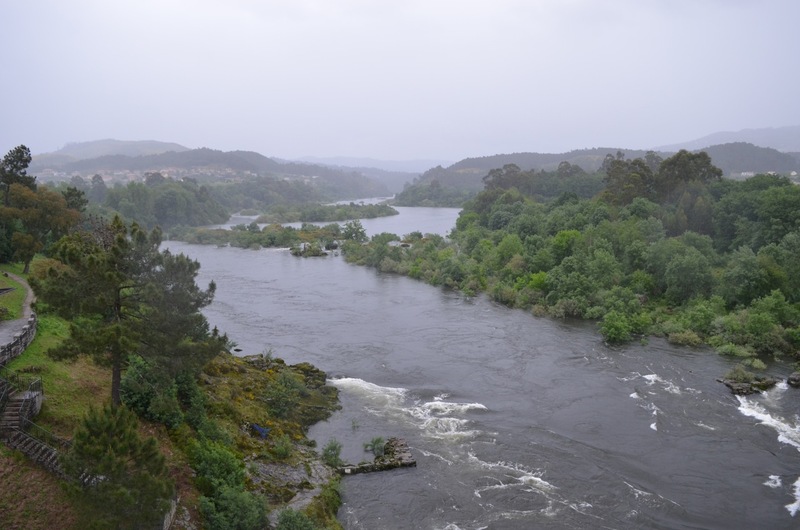 Day 18 – Portugal! – for people. for nature. 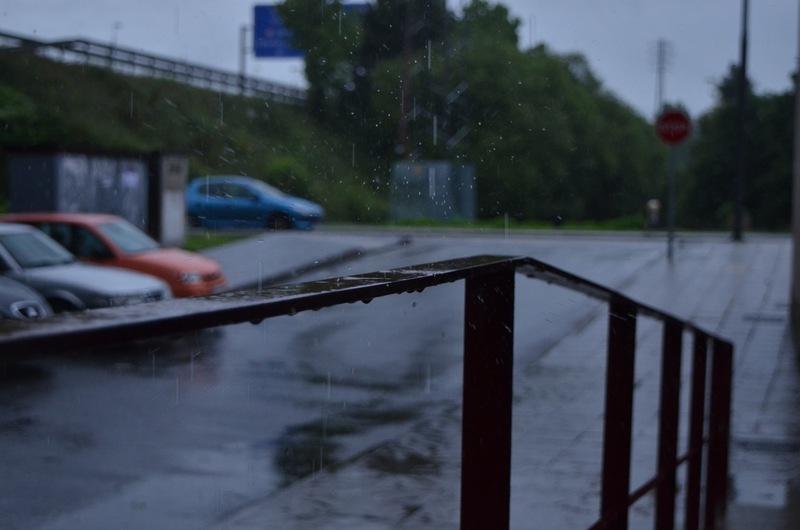 I decided to try and get a bit arty with the rain shots outside the hostel this morning since I have so much to practice on. We headed southeast out of town on the PO-510. We hadn’t been on a PO road before, and we assumed it would be pretty quiet. It turns out that PO roads are not always quiet but they are relatively badly maintained. When it turned out there was no hard shoulder to ride on, Anna resorted to riding in the gutter. She is convinced that to ride on the road means death. We stopped for lunch in a town called Salceda, where I was tempted once more by a massive empanada. I hope they have empanada in Portugal! 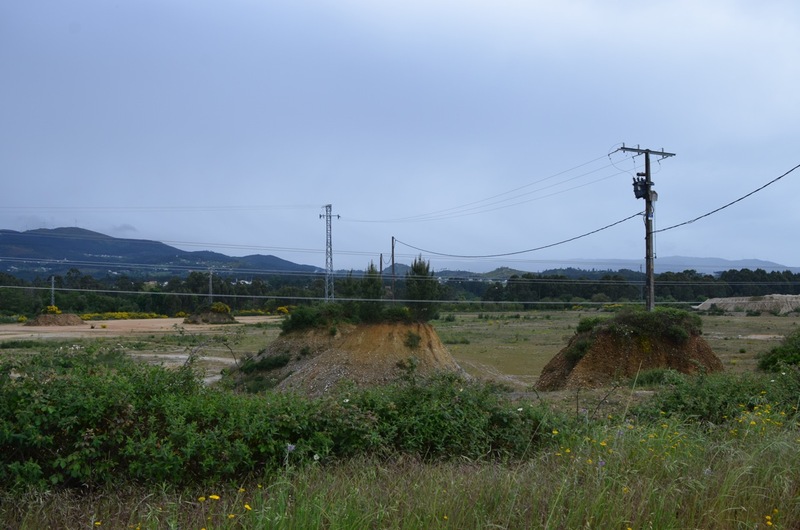 We went past a quarry where they had quarried out all the earth except the bits around the telegraph poles, which were proudly standing even taller than usual on the devastated landscape. It was comical. Not the devastation obviously. 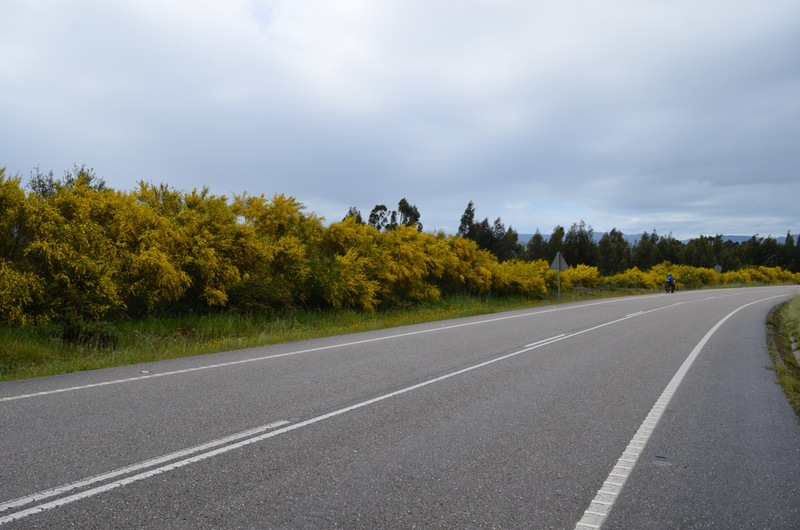 The roads were even more broom-endowed than usual. The rain was on-off and everything smelled amazing in between showers. It was a really lovely ride except the constant threat of saturation, either frown rain or sweat-filled waterproofs. We did a bit of climbing and eventually found ourselves on a ridge looking down into the valley of the River Mino, which forms the Spain / Portugal border. And what did we see on the Portugal side? SUNSHINE!!!! 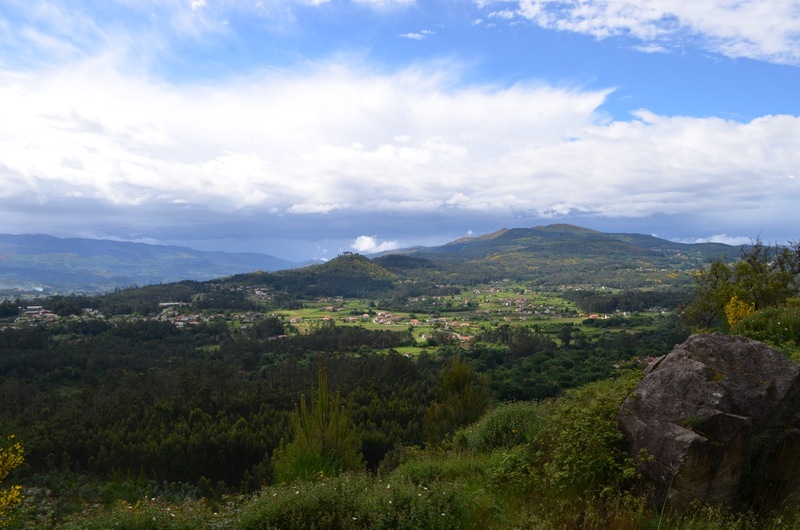 We whizzed down the valley and headed towards the town of Arbo, the last one before the border. On the way we went past loads of crosses at the side of the road that looked like memorials, with people’s names on them. There was also a little fenced off graveyard bit, along with a tiny coffin. Were were a bit confused at the time; it turns out it’s part of a protest against a new high-voltage electricity line that will pass through the area. 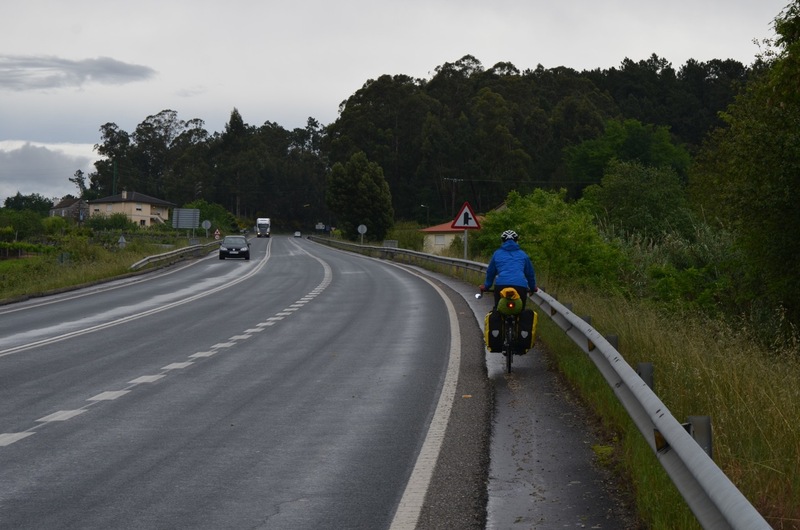 We went through Arbo pretty quickly, keen to get into Portugal, where we assumed it would be sunny and hot. The River Mino did not encourage us though, it looks like there could be several small villages submerged under it’s swollen course right now! 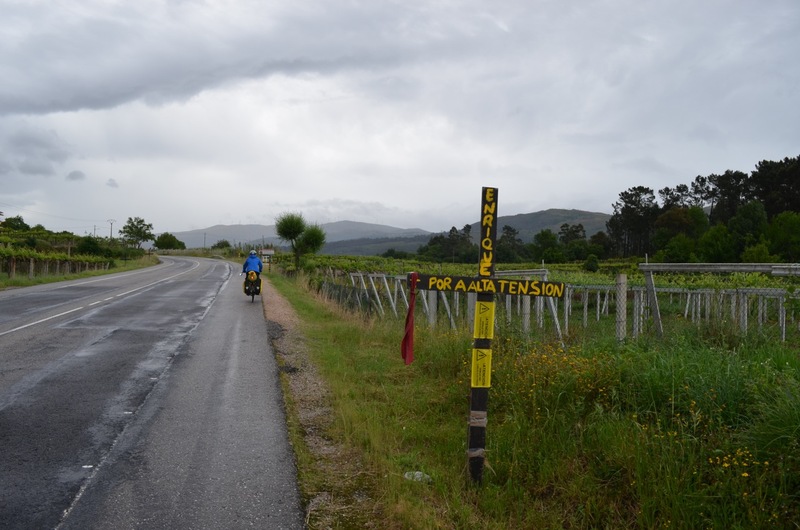 And sadly the rain did not stop at the border. Boo! The campsite was just over the border. Anna navigated us there like a pro, sadly it was all for naught as they are shut until the 9th May. Doh! The chaps there directed us to the youth hostel, which was a 20 minute ride away up another rainy hill. When we got here we thought it was a hotel, but sure enough we have been given our own 4-bed dorm, and hopefully no-one else will turn up so right now things are looking good. It was twice the price of the Camino hostels, but if we get a snore-free sleep tonight it will be worth it!